Father Andrei Tkachev is a Leopolitan, which is a really awesome way to say he hails from the city of Lviv, in Western Ukraine, a city meaning "Place of the Lion". Sadly, the situation in Ukraine has turned violent in the last several years, and Father has moved to Moscow with his family where he serves as one of Russia's most beloved priests. In this interesting video, he tackles the demonization of Russia. Have you ever actually wondered why the west hates Russia so much? We have. And to be clear, this hate isn't new and didn't begin with McCarthyism. 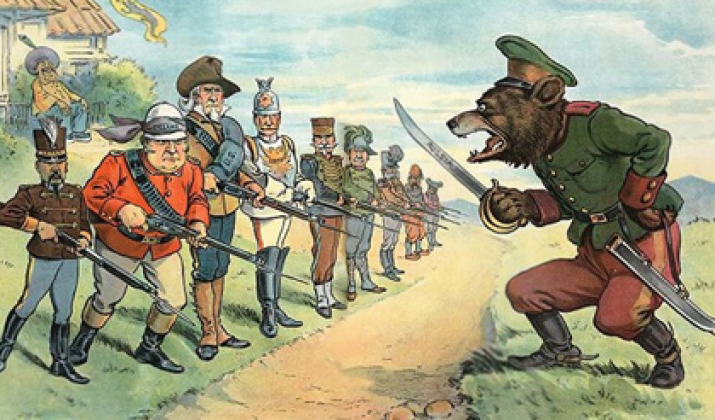 The west has not simply hated, but demonized Russia for centuries. Father Andrei not only explains why this is but what Russians should do about it. Father Andrei points out that if you've ever read Western European newspapers going back centuries you would find the exact same Russophobia as we see today. I can personally attest to how creepy it was because when I read pre-WW1 newspapers, I found them speaking about "Russian Aggression" and how the "civilized" Germany and Europe needed to stand up to the "Slavic barbarians" of Russia and Serbia. They spoke in dead seriousness, how there would never be a war because Russia was too weak, but it needed to be reprimanded by the mature, European powers, for its aggressive behavior. Eerily, they reminded me exactly of the mainstream media today. For years, I've come up with complicated intellectual plans to counter this; what will I do to convince everyone that this is wrong? After watching Father's video I learned what I will do. Absolutely Nothing. To be clear, I don't mean that literally, but I realized trying to convince the main stream media of Russia's virtues is a lost cause. Father likens this to a lamb trying to reason with a wolf, and convince him not to eat him. This is the Russian equivalent of the English story of the scorpion and the frog. In short, some people are just evil, their agendas are evil, and it will always be this way. They won't change their nature, and neither should good people. I believe that is Father Andrei's way of conveying the ancient Russian proverb of what boils down to "haters gonna hate". Excuse me while I giggle at the thought of one of my favorite priests of all time saying those words. Rather than wasting my breath, I was reminded that I would be much better served sharing the positive aspects of our Russian Faith and culture with compatriots and friends who want to hear the truth. And, of course, try to become a better Christian. "Russia is the last bastion, and if it will be broken down, then the game is over, and the end of days will come." A Thousand Years of Following Christ: What makes Russian Orthodoxy unique?